At 3,726 metres above sea level, Mount Rinjani looms large over the entire island of Lombok in Indonesia. 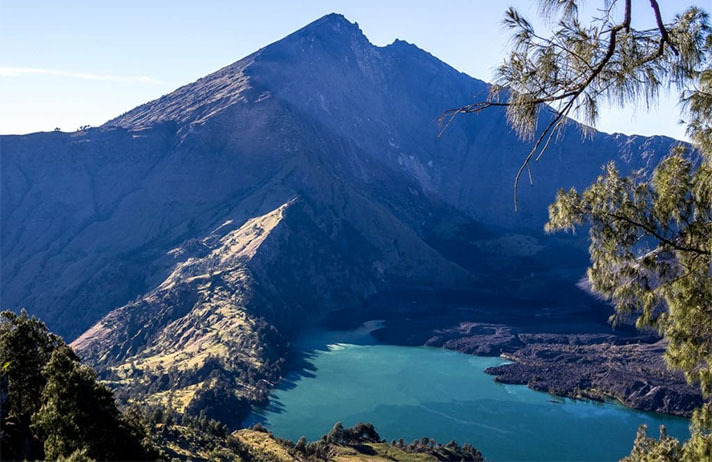 Of the 130 volcanoes in the country, Rinjani is the second highest (topped only by Mount Kerinci on Sumatra). Rinjani’s ominous silhouette is a constant reminder of the powerful forces rumbling just beneath the surface of the earth. Lake Segara Anak, nestled in the bottom of the gaping crater, is a deep turquoise, echoing the spectacular colour of Lombok’s seas. On the edge of the lake sits an active volcano, Mount Barujari, which steadily spews threatening clouds of smoke into the air.